Arizona Center, Phoenix’s original downtown entertainment destination located at 3rd St. and Van Buren, has begun construction on its $25 million makeover. Acquired by Parallel Capital Partners and Angelo, Gordon & Co. in December 2015, the one million square foot, mixed-use development will be revived as the heart of Downtown. 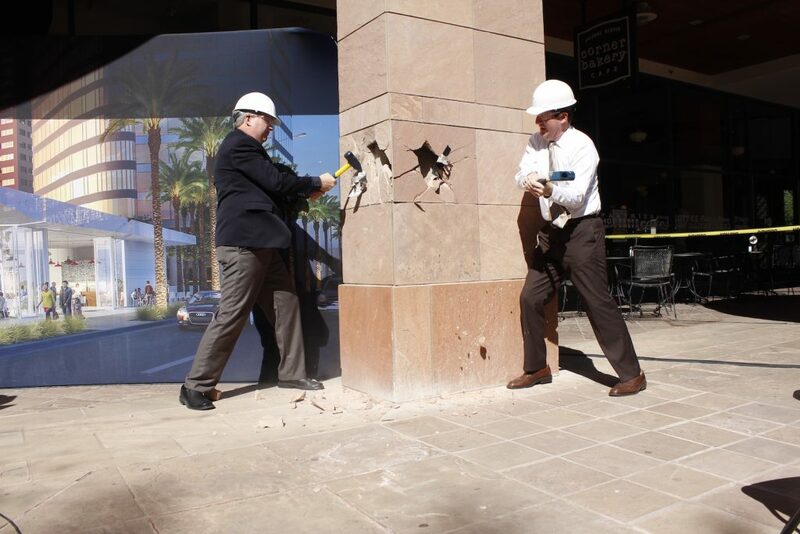 Jamie Cronemeyer, SVP of Operations for Arizona Center owners, Parallel Capital Partners, and Phoenix Mayor, Greg Stanton, take sledgehammer to flagstone signifying the beginning of the Arizona Center retail refresh. During a building breaking ceremony on March 14 at Arizona Center, Parallel Capital Partners Sr. Vice President of Operations, Jamie Cronemeyer, along with Phoenix Mayor, Greg Stanton, took sledgehammer to flagstone, knocking giant holes in the current façade, which will be given a significant facelift beginning immediately. Arizona Center owners announced that New York-based Skanska USA will handle construction management for the project. In addition to the construction partners being announced, Cronemeyer also announced that a boutique hotel and multi-family housing will also be added amenities at Arizona Center. Final negotiations of these partnerships are underway and will be announced soon. The addition of a hotel and multi-family housing will increase the vibrancy of Downtown making Arizona Center, once again, a true downtown destination. The architect of the project is Gensler, a global architecture, design, and planning firm. The current introverted space will be opened to the surrounding streets and the urban neighborhood, creating a more interactive and spontaneous experience that connects to the existing fabric of downtown Phoenix. The one-million-square-foot multi-use project will create a 360-degree experience that communicates the unique attributes and identity of Arizona. Specific transformative elements include site furnishings, shade structures, landscape, lighting, new materials, fixtures and finishes, wayfinding, and branded signage features. In addition, the current parking garage at 5th and Fillmore streets will be upgraded, and a valet parking element is being added on 3rd St., between Van Buren and Fillmore streets. In addition to Gensler, PdO is working on the interior redesign for One Arizona Center, and Smith Group JJR is supporting development strategies for the entire property. The joint venture of Parallel Capital Partners and Angelo, Gordon & Co. paid $126 million for the 16-acre Arizona Center multi-use complex with entitlements for an additional 3.9 million square feet of improvements. For retail leasing information, contact Brent Mallonee of Cushman Wakefield at 602-224-4437 or brent.mallonee@cushwake.com. For office leasing information, contact Mark Stratz at 602-224-4427, mark.stratz@cushwake.com scott.baumgarten@cushwake.com. For additional leasing information, visit http://arizonacenter.com/leasing-information/.